Greg is also the subject of a short interstitial piece called “Re-directing Comics.” Sort of our shout-out to Scott McCloud, Greg traverses through the panels of the book to speak directly to the reader. Below is the complete, unedited interview we did with Greg in preparation for the “Re-directing Comics” piece. And speaking of interviews, check out the Greg’s recent conversation with Matt Brady over at Newsarama! 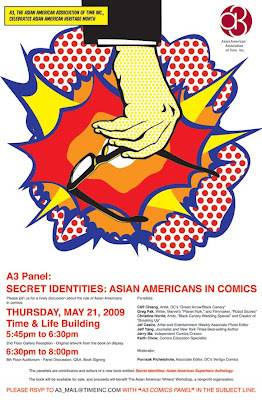 SECRET IDENTITIES: First of all, how does being Asian American inform your work? GREG PAK: Over the past few years, I’ve written about robots, monsters, mutants, aliens, renegades, demigods, African American cyborgs, persecuted German Jews, and Korean American teenagers. Looking back, I’m realizing that almost all of those characters are outsiders and outcasts of some kind or other. Now I’m a suburban kid from Dallas whose family and friends and community gave me all the support and every opportunity in the world. But growing up Asian and multiracial in America, I was aware of race and racism from a very young age. I knew some people would always see me as different. And no doubt that predisposed me to take an interest in the kinds of stories I’m writing today. On another level, the very specific ways in which my family would communicate or not communicate has probably had a huge influence on my ear for dialogue and contributed to my interest in the idea that a huge amount can be said through what’s not said. Of course, that silent communication comes as much from the German/English as the Korean side of my family. But all of that’s part of my specific, multiracial, Asian American experience, and it probably echoes through just about everything I write. So what does being an “Asian American comic creator” mean to you? First and foremost, I’m just trying to tell the most compelling stories I can. But as an Asian American creator, I pay particular attention to the way I depict people of different backgrounds and I make a special effort to expand the diversity of the characters I work with. I’ve been pretty thrilled about the opportunity I’ve had to create Asian American characters at Marvel and in my creator-owned work (like the piece in this book!). And it was fun to be able to bring the Grace Park character to the foreground in the “Battlestar Galactica” series I wrote for Dynamite. But in a funny way, one the most obvious expressions of this interest in race and diversity might just be hiding in plain sight in the “Planet Hulk” epic I wrote for Marvel. In “Planet Hulk,” the Green Goliath is exiled to a savage alien planet where he goes from slave to gladiator to rebel to conquering emperor. Along the way, he fights, then bonds with a group of alien gladiators whom everyone else sees as monsters. But all of these different aliens end up proving themselves — even the Brood, who’s a member of a species universally reviled as irredeemable killers. So behind this crazy sci-fi epic is an exploration and evisceration of racism. How ’bout them potatoes? Some of the biggest names in the biz are Asian American, yet there are very few Asian characters of any significance. Why the discrepancy? Most of the big name Asian Americans in comics are artists. But new characters are usually created by writers. As more Asian American writers hit the scene, I think there’s a good chance we’ll see more prominent Asian American characters. Why is the superhero story a powerful metaphor for Asian American identity? I’m probably bucking the conventional wisdom here, but I’m not sure I accept the premise of the question. I think the superhero genre has great power and attraction for many individual Asian American readers, including myself, but I see it more as fantasy than metaphor. And it’s worth noting that a huge number of the Asian Americans working in comics aren’t doing anything related to superheroes. They may indeed be brilliantly exploring questions of Asian American identity, but they’re using different genres, from autobiography to quiet realism to manga influenced wackiness — superheroes may not speak to their particular Asian American experiences at all. But let me try to be a little more helpful here… To me, the superhero genre — like the Western and the gangster story and the barbarian tale — is all about the fantasy of power. We live in a world in which we sometimes feel more powerless with each passing day. The superhero story lets us imagine that an individual can make a difference, that irrational rules can be shattered, that force can be used fairly to bring justice to a corrupt world. Of course, the really great superhero stories actually challenge that fantasy of control. I think that’s why the Hulk in particular is so compelling — while he always gives us the visceral satisfaction of smashing the people we want him to smash, he always pays the price for his uncontrolled rage. So why is the genre particularly compelling to certain Asian American readers? Maybe because we’ve been stigmatized like poor ol’ Peter Parker as the nerds, the rejects, the outcasts. Or maybe, like some of the X-Men, we’ve clipped our own wings, suppressed our true talents in order to fit into the world that other people have crafted for us. Maybe we’ve suffered terrible injustice, and, like Batman, ache for revenge. Or maybe we’ve just been too silent, too quiet, and too fearful, and superhero stories help us prepare to stand up and speak out the next time. Or maybe we just dig the crazy costumes. In short, I’d guess that Asian Americans love superheroes for the same reasons everyone else does. So what’s the point, you might ask? Why bother talking about Asian American superheroes if Asian Americans dig superheroes the same way everyone else does? Because Daredevil is more compelling because he’s Irish Catholic. Magneto’s more compelling because he’s a German Jewish Holocaust survivor. And the next great Asian American superhero will be more compelling because his or her background adds nuance and depth to his or her character. The diversity enriches the entire universe in which these stories play out and the specificity makes the characters more compelling and believable to everyone. Then what makes an Asian American superhero different from other superheroes? He or she is Asian American. And depending on the individual, that can mean anything or nothing at all. I’m all for as much variety as possible — and for as few proscriptions as possible about what an Asian American superhero should or should not be. Every one of us is different — Asian American superheroes should have just as much diversity. A lot has been made about your creation and inclusion of Asian American characters (like Amadeus Cho) in the Marvel Universe. Was it important for you to have Asian Americans play important roles in your stories? Absolutely. As an independent filmmaker, I knew that the only surefire way to get non-stereotypical Asian American characters on the big screen would be to put ’em up there myself. And it’s the same thing in comics. I’m in a position to actually create these characters from time to time. If I didn’t, what kind of bozo would I be if I ever complained again about the lack of Asian Americans in American pop culture? Speaking of your career in film, how has being a filmmaker influenced you as a comic book writer? I think it’s helped me enormously. I had a lot to learn about the specific challenges of writing comics — I’m learning something new every day. But my training as a filmmaker gave me a good foundation for visual storytelling as a comic book writer. But maybe the most unexpected influence my filmmaking background has had on my comics writing has been revealed through sound effects. I’ve always loved working with sound design in film — I love the way the right sounds can almost subliminally smooth out a scene, make a transition work, or pump up the emotional impact. So in comics, I’ve had a lot of fun trying to reproduce some of the impact of a film effects track by manipulating the size and placements of printed sound effects to create transitions, subtle background noises, and, when necessary, chest-shaking, Dolby-powered, Mighty Marvel THRAKKADOOOMS! Comics, baby. Gotta love ’em. “THE CITIZEN” can be found on page 56 of “Secret Identities: The Asian American Superhero Anthology“. The story follows Frank Murakawa, a Sergeant from the Arizona National Guard who was exposed to unknown chemicals during a training accident endowing him with amazing abilities — turning him into… THE CITIZEN. Incarcerated for attempting to arrest the former President of the United States for war crimes, The Citizen finds himself released from prison by the new Commander-in-Chief, enlisting his help. New York Comic-Con ’09: The Secret Identities Panel! Secret Identities E.I.C. Jeff Yang here. I guess I’m the last SI Guy to post on this thing, so I might as well kick in here with this video, an edited-down “highlights version” of one of our two New York Comic-Con panels—the one focusing on the book itself, and featuring myself, E.A.L. Keith Chow, contributor Greg Pak, with an assist from his partner on “The Citizen” Bernard Chang, and Senior Artist Jef Castro. Providing insightful moderation of our little circus was Giant Robot‘s Anne Ishii, who’d just come off of moderating a previous panel on the manga version of Bat-Man that was published, well ahead of its time, in Japan in the late 1960s. Ningin.com did a nice writeup of the panel here. Big thanks to Keith’s bro Raymond for manning the Canon HG10 for us on this one. Sadly, he wasn’t around the following day, so I don’t have any footage of the equally terrific panel I moderated called “The Multicultural Mask,” featuring Stuart Moore (Iron Man; Firestorm), Perry Moore (Hero), Robert J. Walker (Delete), and Jann Jones (Coordinating Editor, DC Comics)—not to mention Greg Pak again, who pulled double duty for us at NYCC, all power to the Pak. However, a nice writeup on that panel is right here. And I’ll see if I can find any still photos around somewhere.